Vancouver Canucks centre Elias Pettersson (40) celebrates his goal past Detroit Red Wings goaltender Jonathan Bernier (45) during first period NHL action in Vancouver, on Jan. 20, 2019. 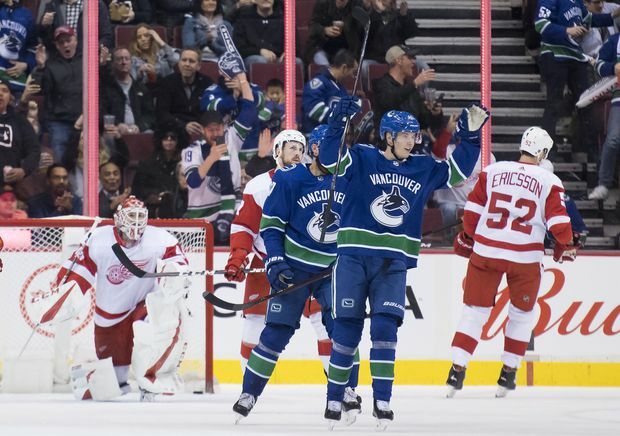 Elias Pettersson tallied two points in his return to the lineup for the Vancouver Canucks on Sunday, but the star rookie was more concerned his mistakes. “I felt I lost the puck a few times, made some bad decisions, some turnovers. But I’ve just got to play it simple,” he said after Vancouver beat the Detroit Red Wings 3-2. Pettersson had a goal and an assist in the victory. It was his first game back since he suffered a slight MCL sprain against the Montreal Canadiens on Jan. 3. “I thought he was pretty good for being out for a bit,” Vancouver coach Travis Green said. The Canucks (23-21-6) have taken eight points from their last five games but have struggled to get going early. Though Pettersson’s first-period marker gave Vancouver an early lead Sunday, the team was forced to claw back from a 2-1 deficit after an ugly second period. The Canucks were sloppy with the puck and late getting places across the frame, Green said. “We were lucky they didn’t score more in the second,” the coach said, adding that during the intermission he didn’t know whether to tell his players he was mad at them or feel sorry for how poorly they were playing. Bo Horvat evened the game at two 7:27 into the third period, sweeping in a low wrist shot in for his 18th goal of the year. The tally broke a scoring drought for the Canucks centre, who had 38 shots but not a single goal in his previous 11 games. Antoine Roussel scored the game-winner for Vancouver. Frans Nielsen and Thomas Vanek put up goals for Detroit (18-25-7). Vanek, a former Canuck, said it’s frustrating for his team to give up another third-period lead. The Wings dropped a 6-4 decision in Calgary on Friday, too, and the loses are tough on the team’s confidence, said head coach Jeff Blashill.